You hear it everywhere that business teams are hungry for analytics. They crave accurate predictions and forecasts to allow them to make better business decisions, faster. The problem is data has become so complex that most of the time they have to wait for it to be analyzed and presented. They waste time waiting and when the report finally arrives it doesn’t provide what they wanted. The whole exercise of doing business analytics today is a time-consuming, costly, and frustrating experience for everyone involved. At the same time, getting actionable insights into the hands of everyone is increasingly important to improving business operations and future competitiveness. Ugh. It’s time for something to change in a big way. This is why you're seeing a new wave of disruption in data analytics tools with the concept of augmented analytics gaining momentum. 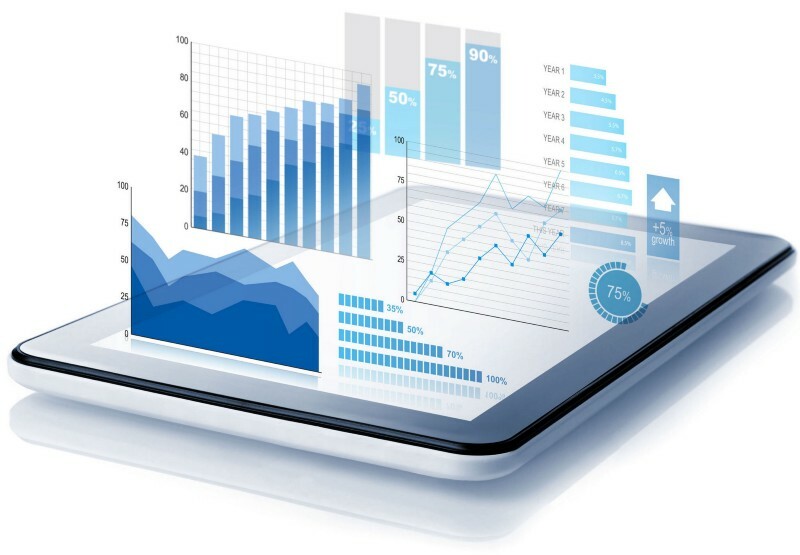 Augmented analytics gives anyone from technical users to data scientists, to business users the ability to access the intelligence they need to make decisions. It combines AI and Natural Language Processing (NLP) to expose previously unseen insights on any data. Under the hood, an augmented analytics platform uses artificial intelligence and machine learning to automate data preparation, insight discovery, and sharing. They may still include traditional BI functions like dashboards and reports but augment them with natural language BI for a search-like experience. These interfaces allow business users to interact with their data and find insights on their own. Imagine what your data science teams could get up to if they didn’t have to answer every single business user’s question. For your data scientists, augmented analytics provides an approach that automates insights using machine learning. It’s unlikely full automation is possible but a number of the more time-consuming steps to discover and prep data can be automated. It’s anticipated that automating these steps alone could shave weeks off analytics projects. Additionally, because these platforms can connect directly to any data, anywhere, the chance for adding unintended bias is reduced. This is important when creating training datasets for machine learning because removing bias will make models more accurate. Augmented interfaces: you can expect augmented analytics tools to be easier to use. Providing natural language processing as well as conversational interfaces are naturally more intuitive and user-friendly for business people. Automate data discovery: because augmented platforms are connected directly to data sources, data engineers can instantly discover data, relationships, and correlations. This enables them to dynamically blend data across sources. The result is the creation of the widest possible datasets within a few minutes. More agile business intelligence: augmented analytics will enable data analytics to be delivered faster across the enterprise. Analytics will require fewer resources but increase data access by allowing business users a true self-service experience. The net result of implementing an augmented analytics solution is it exponentially increases in your organizational data literacy. You’ve broken down the old barriers so data and analytics become the backbone of every decision at every level of your organization. With that, you leap forward in the analytics maturity model and never need to look back. We’re at the beginning of the augmented analytics journey and it promises to be an exciting ride. Buckle up! Before we dive in, let me overlay this discussion with the main business trend that is behind some of these technology trends. Digital Transformation. 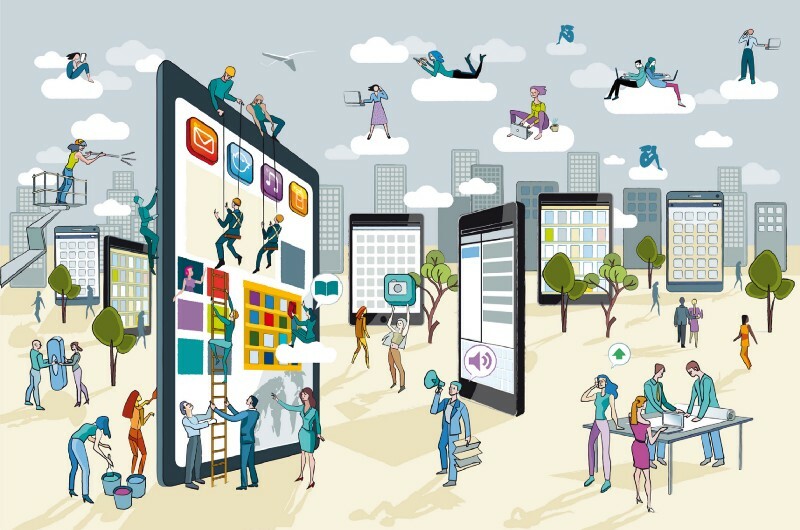 “Digital transformation marks a radical rethinking of how an organization uses technology, people and processes to radically change business performance”, says George Westerman, a principal research scientist with the MIT Sloan Initiative on the Digital Economy. 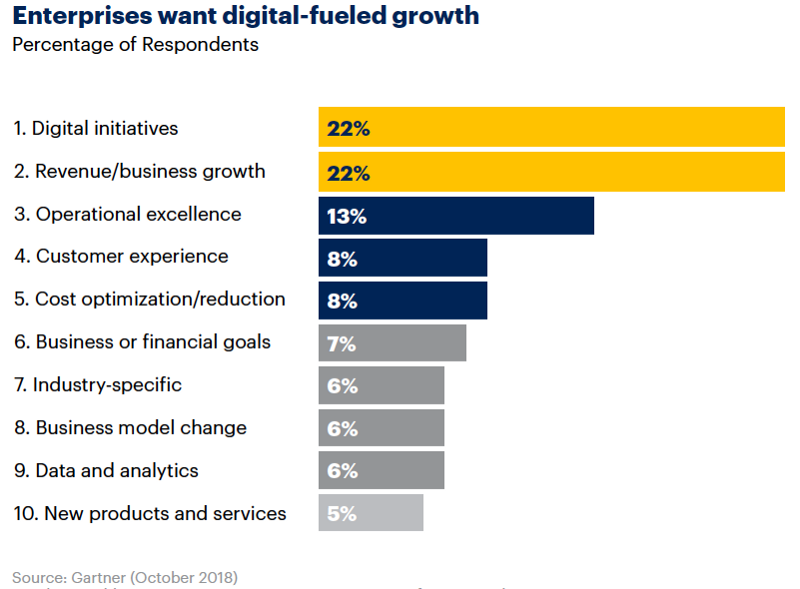 According to a recent CIO Gartner survey, Digital initiatives and revenue growth are top priorities for enterprises in 2019. Digital initiatives combine disruptive technologies, like Big Data and AI, with existing infrastructure to innovate business processes and deliver new products and services that improve customer experience and therefore drive growth. In 2019, digital initiative investments cover a wide range of technology with analytics and BI solutions leading the list. According to the survey, investment in analytics and BI tools is expected to increase by 45% to support Digital Transformation efforts. Technology leaders see analytics as a core component to successfully delivering transformative solutions to the business. With that, let’s breakdown three of the top analytics trends for 2019 and how they support Digital Transformation. According to Forrester, insight-driven organizations grow 30% faster than their less informed peers. In the past, self-service analytics promised to enable business teams with analytics, but reality shows that traditional BI, even with self-service, achieve adoption rates of less than 25%. There are a variety of reasons for this anemic performance, but in simple terms, it is because they require business users to understand too much about how the data is constructed and dedicate precious time to learning a new application. As a result, most business users rely on others to answer even basic questions which could mean they wait days, if not weeks, for the result. If only 25% of your organization has access to analytics, it is virtually impossible to become a data-driven organization. To combat this problem, in 2019, more analytics platforms will integrate Natural Language into their platforms. Natural Language Processing (NLP) promises to turn self-service analytics on its head by focusing on delivering solutions for non-technical business users, i.e., the other 78%. Natural Language BI allows business users to ask questions, in human language, and get answers, usually in the form of a dynamically generated chart. They can ask follow-on questions to explore deeper and run what-if scenarios without needing to understand how the data is constructed. More importantly, the interactions with data analytics can be done within applications your business users are already familiar with using, like Slack, using NLP APIs. Done right, Natural Language BI has the promise to close the data gap for business users and create the data agility needed to uncover insights that can transform business. Adding NLP to BI platforms is just the beginning changes we’ll see in 2019 geared towards non-technical business users and in support of Digital Transformation efforts. The answer to this question is at the junction of AI and NLP. NLP enables the question to be asked, in plain English, and AI answers the question. This is also where AI and BI converge to create something new, Augmented Analytics. In 2019, analytics platforms will move in earnest to leverage AI/machine learning under the hood to prepare data for analysis, analyze it, and interpret results into predictive insights that can be used to take action. Data is only getting more complex and dispersed. Enterprises are awash with data, but IT continues to struggle with finding ways to collect it from diverse sources and make available in time for the business to get value out of it. The current status quo is to involve multiple teams to move, aggregate, transform and prep the raw data before using it for machine learning or analytics. This means you are applying machine learning on already biased data that was created based on predetermined questions. 2019 marks an inflection point for analytics, as machine learning/AI becomes more mainstream the traditional extracting, transform, and load data into analytics platforms make even less sense. Data and business pushed by new digital initiative are just moving too fast to wait weeks for data pipelines to be built. We’ve entered a time where data agility is critical to success meaning the old way of custom coding data pipelines or building rigid schemas for a centralized data warehouses/data lakes needs a rethink. In 2019, more analytics solution providers will expand their data management capabilities. New approaches, like smart data discovery, which applies machine learning/AI to raw data to discover relevant data relationships and correlations automatically will become more prevalent. The intent behind using AI here is to augment human component in a way that reduces unintended bias created by manipulating data when prepping it for analytics. By using smart data discovery on raw data, it becomes possible for the corresponding insights to be surfaced without any preconception of the answer or perhaps even the question. Implementing technology is only part of the battle there are other moving parts involved. 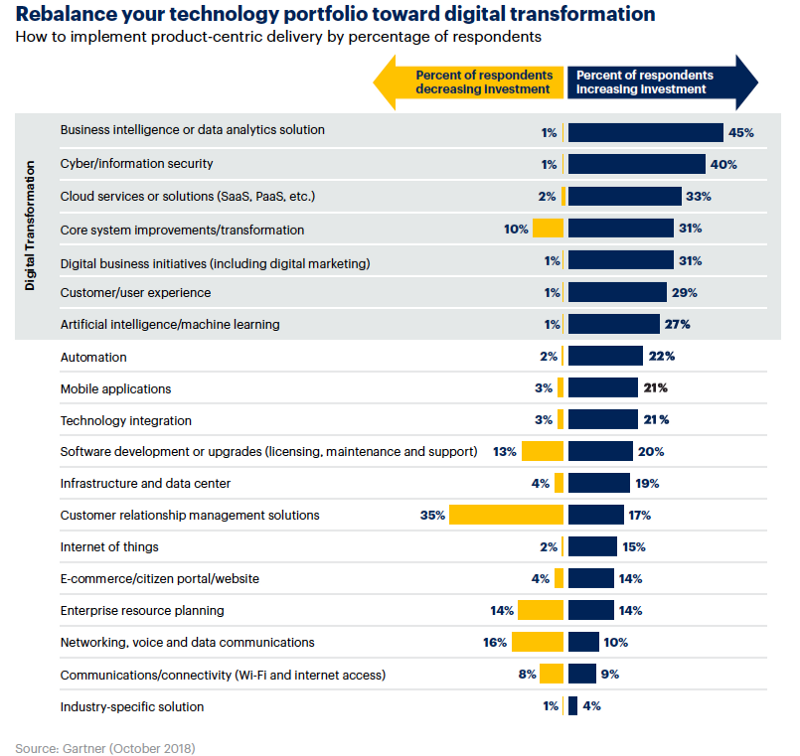 Below are some potential inhibitors that need to be addressed alongside technology implementation if business leaders hope to advance their Digital Transformation efforts forwards in 2019. AI is a black box and just because it has the “AI” stamp of approval doesn’t mean the result can be trusted. Business executives will ask how you came to a specific conclusion. Saying “the AI told me” probably isn’t the going to be enough to convince anyone to take action. Being able to explain how you came a particular recommendation is going to be required before anyone will trust the AI behind it. Data ethics is a top of mind topic for many with data privacy and data use laws like GDPR going into effect in 2018. Additionally, the use of personal data to feed the “fake news” engine may result in similar legislation being applied more globally. As a result, the topic of data ethics is no longer restricted to data collection but also applies to how data and resulting insights are used. With more data put into the hands of more people additional training on the do’s and don’ts of data use become essential to avoid unwanted appearances in news cycles. We’ve talked a lot about how technology is helping reach the other 78%, but there is still a human factor to the equation that can make or break success. Developing a data-driven culture within your organization means not only providing the tools but developing the processes and providing necessary data literacy training. Data literacy training ensures everyone knows how to perform experiments and create compelling stories using data to put forward a persuasive argument to take action. This year will be interesting on many fronts but mostly to how analytics solution providers, new and old, start to leverage AI for good, the level of push back within leading organizations, and the corresponding fallout for product roadmaps. I think the technology is moving faster than business right now and the increase in anxiety AI creates for analytics leaders will force a slowdown in its adoption. Some of the predictions about the level of impact of AI in the market sound overly aggressive, at least to me. However, the movement is unmistakable. If you are in a position to influence your organization’s analytics strategy, it will make sense to prepare for the world of augmented analytics. Begin to assess the impacts implementing augmented analytics may have to data architectures and near term technology decisions. At the same time, the long pole for Digital Transformation is more likely to be process and people than technology. History has proven that humans are good at stifling innovation so the sooner you being to evangelize augmented analytics, to inspire imaginations versus instill fear, the more likely your Digital Transformation efforts will succeed enterprise-wide and actually transform how your business operates.